Edward L. Widmer has been appointed director and librarian of the John Carter Brown Library, marking the library’s first change in leadership in 23 years. Prior to this, Widmer served as inaugural director of the C.V. Starr Center for the Study of the American Experience and associate professor of history at Washington College in Chestertown, Md. He will begin his new post July 1, 2006. PROVIDENCE, R.I. — The Board of Governors of the John Carter Brown Library named Edward L. Widmer as the new director and librarian of the John Carter Brown Library beginning July 1, 2006. This is the library’s first change in leadership in 23 years. Prior to his time at Washington College, Widmer spent several years at the White House working with President Bill Clinton. He served as special assistant to the president for national security affairs, writing foreign policy speeches, and later counseled on history and scholarship-related issues as senior advisor to the president for special projects. Until 2004, Widmer conducted extensive interviews with Clinton while the former president drafted an autobiography. Also an award-winning author, Widmer is widely published on topics in American history and politics. His first book, Young America: The Flowering of Democracy in New York City, was the recipient of the 2001 Washington Irving Literary Medal. He is the author of Martin Van Buren, the co-author of Campaigns: A Century of Presidential Races, and is currently working on Ark of the Liberties: America and the World. Widmer is a contributing editor to The American Scholar and a frequent contributor to a variety of publications, including The New York Times. 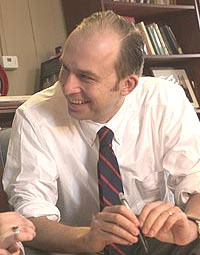 Widmer was appointed lecturer on history and literature at Harvard University from 1993-1997. He earned a Ph.D. in the history of American civilization, an A.M. in history, and an A.B. in the history and literature of France and America from Harvard University. Widmer calls it a “particular honor” to be succeeding Norman Fiering, who has served since 1983 with great distinction. Under Fiering’s leadership, the library has significantly improved and expanded the collection, increased access of researchers to its primary historical resources, mounted widely heralded public exhibitions, and published scores of resources on the collection. He will retire at the end of this academic year. The John Carter Brown Library is an independently funded and administered institution for advanced research in history and humanities, founded in 1846 and located at Brown University since 1901. The facility holds one of the world’s leading collections of books, maps, and manuscripts relating to the colonial period of the Americas, North and South, from 1492 to ca. 1825. It also offers fellowships, sponsors lectures and conferences, regularly mounts exhibitions for the public, and publishes catalogues, bibliographies, facsimiles, and other works that interpret the library’s holdings.